SpaceShipOne program proved that it was possible for a non-military organisation, not only to send a manned vehicle into space, but also to do it at much more reasonable costs and with much shorter deadlines. Yet as he likes to underline himself: "SpaceShipOne was a personal goal, not a customer request." But SpaceShipOne was only a stepping stone to more ambitious prospects. With Virgin mogul Richard Branson, Rutan devised the SpaceShipTwo followup program, but also worked on a series of space station modules that would complement the "space renaissance", as he calls it. In Rutan's vision, the "Next Steps for Private Spaceflight" involve sub-orbital flights under a proper spaceline (Virgin Galactic), and with an optimized travel experience (large cabins, large windows, and body weightless float). 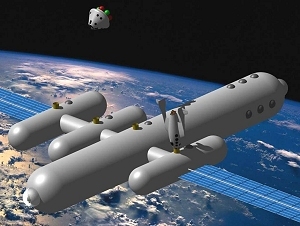 Mid-term plans involve multi-spaceport operations with over 40 suborbital spaceships and 1 to 2 flights per day, which implies competing spacelines and a plan to fly over 100,000 people during the first 12 years of commercial operations. Despite Rutan's focus on the 'fun' aspect of things, he believes that it can only be an incentive to reach further, and that kids need to be inspired by far-out goals involving scientific breakthroughs and discoveries. "We are boring our youth" he declared before an audience at Oshkosh. "The education statistics are bleak" he said, and regretted that children grow up in a world that seems crowded with lawyers, politicians, actors "and other criminals" (undoubtedly said in tongue-in-cheek humor), while science and engineering do not enjoy a positive image. For him the solution is twofold: take real risks to motivate our kids through exploration, adventure and scientific breakthroughs; and encourage their search for excellence: "Strive to be great, not to be ‘equal’" (also see inset at the bottom of this page). The main obstacle for space travel to develop is the price of a ticket. Like in early airlines, initial ticket prices are too high for public spaceflights. Those few who have flown commercially have paid 20 to 30 million dollars to orbit the earth for about eight days. Sending rich tourists into space for a few minutes at a time could be immensely important to the future of space travel. 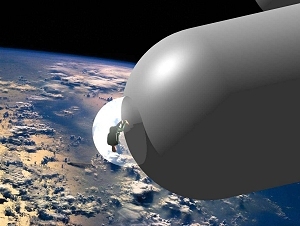 Critics say that suborbital hops above the atmosphere are a sideshow distraction compared to the real challange of getting humans into orbit. But Rutan argues that, from a technical point of view, flying tens of thousands of passengers over 10 to 12 years will do two things: mature safety systems, making spaceflight much cheaper; and reduce costs dramatically. Sub-orbital tickets now cost about 1% of an orbital flight, but Rutan is sure that while the cost ratio for suborbital/orbital will likely remain at that rate as volume increases, the costs will come down significantly with volume. He also postulates an absolute lower limit for the cost of sending humans aloft via rocket power. 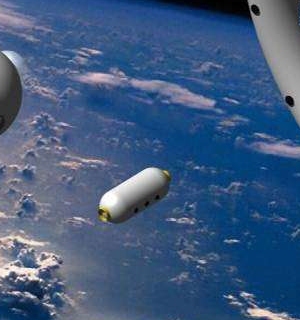 Noting that propellants are responsible for about a third of the total cost of mature forms of travel, such as commercial airflight or automobile transportation, he estimates that a sub-orbital ticket could one day cost as little as $475 per passenger, while a ticket to orbit could cost $12,000. For orbital access to develop, a resort-like destination will be required. In order to to meet demand significant investment will have to be made over the next decade. Under the designation Model 342, Rutan imagined an orbiting fixed hotel with recreation spaces, guest rooms, a concert hall, as well as educational spaces and even "spiritual domes" for meditating in zero gravity underneath the starlit sky. 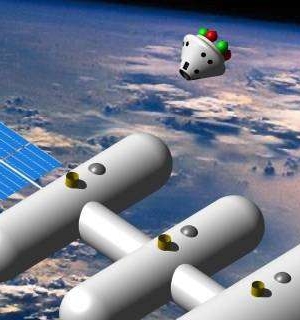 Several SpaceShipOne-like ships could be docked onto the station at once. 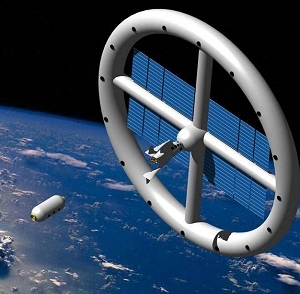 Model 343 is a spinning wheel-like hotel while Model 344 is what Rutan calls a "transfer Limo", a small cylinder-shaped shuttle to travel from one module of the space resort to the next. In some optimistic scenario, Rutan foresees that commercial performance may exceed military within three decades. To back it up, he builds upon studies of the past evolution of technology and markets and believes that a similar revolution to that of aviation is possible. In fact, he is convinced that if space shuttle technology had not been restricted to military and government exploitation, a whole cycle of commercial space travel would have emerged in the 1980s. 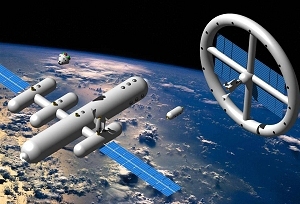 By offering mature, affordable public space access,he believes the reward will be a market share in an enormous industry whose volume will eventually dwarf all other space activities. He also believes that space tourism will produce innovations that cannot be predicted in advance, just as the personal computer industry was unexpectedly spawned when engineers started playing around with microprocessors in the 1970s. Yet when questioned about his motivations, Rutan emphasizes that this time it's not a "capitalist's space race” and that "the new ‘JFK-like’ challenge is for the public [...] not for national prestige." Rutan said anyone offering spacecraft for commercial service should demonstrate their confidence in the system's safety by having their children be among the first fliers, as Branson has said he will do. « My basic concern is that the real value of NASA's contributions that America realized in the 60s and early 70s is now being completely discarded. How can we rationalize a surrender of our preeminence in human spaceflight? In my mind, the important NASA accomplishments are twofold: 1) The technical breakthroughs achieved by basic research (not by Development programs like Constellation) and 2) The Forefront Manned Exploration that provided the inspiration for our youth to plan careers in engineering/science and that established the U.S. as the world leader in technology. In short, it is a good idea indeed for the commercial community to compete to re-supply the ISS and to bring about space access for the public to enjoy. I applaud the efforts of SpaceX, Virgin and Orbital in that regard and feel these activities should have been done at least two decades ago. However, I do not see the commercial companies taking Americans to Mars or to the moons of Saturn within my lifetime and I doubt if they will take the true Research risks (technical and financial) to fly new concepts that have low confidence of return on investment. Even NASA, regarded as our prime Research agency has not recently shown a willingness to fly true Research concepts. For years I have stated that a NASA return-to-moon effort must include true Research content, i.e. testing new concepts needed to enable forefront Exploration beyond the moon. The current Ares/Orion does not do that. While I have been critical of Constellation for that reason, I do not think that NASA should 'give up' on manned spaceflight, just that they should be doing it while meeting the 1) or 2) criteria above.